^ Dan Michael Worrall (1 January 2009). The Anglo-German Concertina: A Social History. Dan Michael Worrall. pp. 4–. ISBN 978-0-9825996-0-0. https://books.google.com/books?id=1-thWE5XRmsC&pg=PA4. ^ Dan Michael Worrall (1 January 2009). 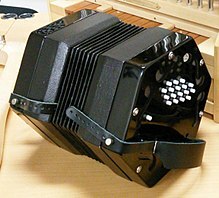 The Anglo-German Concertina: A Social History. Dan Michael Worrall. p.19. ISBN 978-0-9825996-0-0.